Random And Some: "I'm happy here. They like me, I make sandwiches for them"
"I'm happy here. They like me, I make sandwiches for them"
Coming full circle and all that. My bromosexual life partner Tom had been on my case for a long time about The Hitchhiker's Guide to the Galaxy, forcing me to finally buckle down and read the first installment of the five-book trilogy in December. I quickly fell in love with Douglas Adams' witty absurdism, became even more enamored with his universe after watching the H2G movie, thorougly enjoyed The Restaurant at the End of the Universe, and then was kind of let down by Life, the Universe and Everything and So Long, and Thanks for All The Fish. Even to the point that I was hesitant about delving into Mostly Harmless, the fifth and final installment of the Hitchhiker's series. What if it was bad and detracted from the books I did like? Fortunately, Adams righted the space ship with Mostly Harmless. Earthling Arthur Dent is travelling the Galaxy by himself, funding his passage by making donations, mostly sperm, to various DNA banks. During one journey, his ship crash lands on Lamuella, where he becomes an honorable sandwich maker for the local population. When Trillian arrives on Lamuella with a surprise, followed not much later by a Ford Prefect package and Ford Prefect himself, Arthur's life is once again turned upside down. Reporter Tricia McMillian, an alternative version of Trillian, also makes a very important cameo. 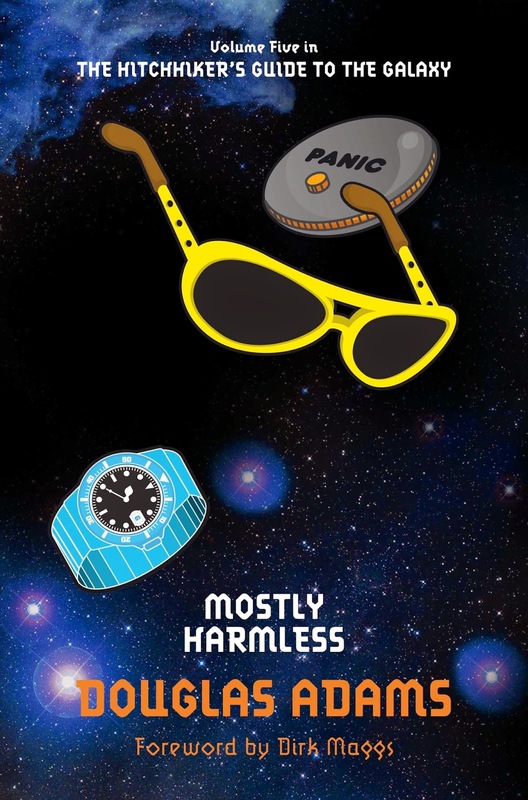 Mostly Harmless delivers most of the H2G wackiness that you know and love, and simultaneously works toward an ingenious and perfect closed-loop ending. It's pretty much everything you could ask for. There are very few laugh-out-loud moments in the book. I read somewhere that Adams was going through some personal problems when he wrote Mostly Harmless, and I think it shows. Sure, the Guide's final installment contains quite a bit of funny parts, but overall, the book is pretty bleak. If you are looking for a happy end, please look elsewhere. By the way, has anyone read And Another Thing..., the sixth book by Eoin Colfer and Adams' widow Jane Belson? "The mighty Gladers, back together again"
"I done a bad thing, I done another bad thing"
"A man loses lots of habits in time"